In August 2013, the ratio of injuries compared to traffic accidents was 29%. It went down to 26% in August 2014 just after the beginning of Vision Zero and continued to decline to 25% in August 2015. It went back to 28% in August 2016 and in August 2017 bringing the trend line to almost a flat line. Motorists injuries exploded over the last 3 years. In August 2013, before Vision Zero started, 1,599 motorists suffered injury in a car accident. During the first year of Vision Zero this number went down to 1511 in August 2014. It then jumped to respectively 2,010, 2,288 and 2,325 in August 2015, 2016 and 2017. The total number of traffic fatalities was below 20 in August 2017 for the first time during a month of August. 19 people died in traffic accidents in August 2017 compared to 24 in July and respectively 25, 21, 22 and 34 in August 2016, 2015, 2014 and 2013. More motorists than pedestrians died in August. The same also occurred in June and April this year. It is quite unusual and it may mark the beginning of a new trend showing that Vision Zero really helped curb pedestrian deaths but not as much as motorist deaths. 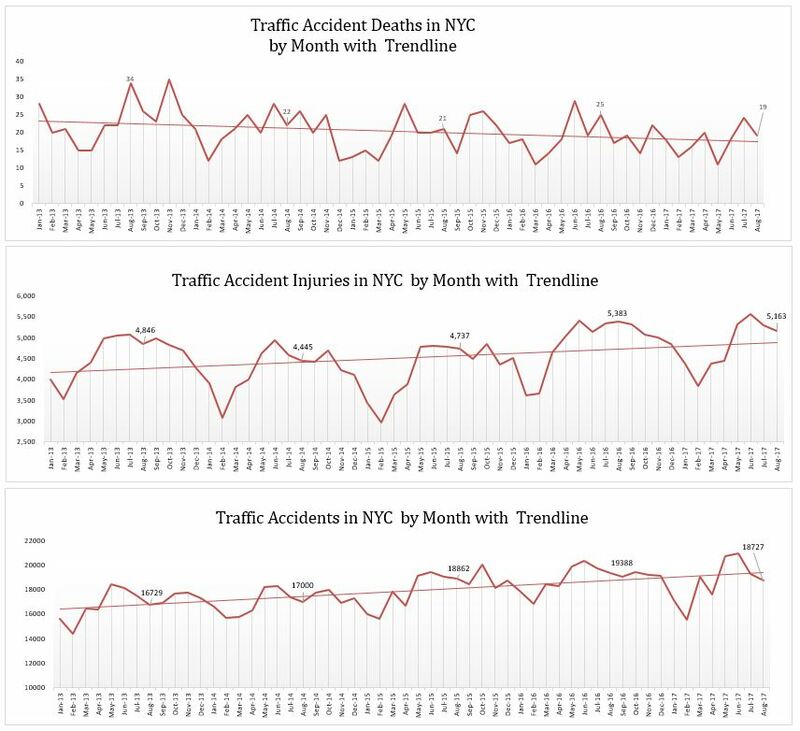 The ratio of traffic deaths compared to traffic accidents was the lowest of all August ratios since 2013 and the trend is showing a steady decline of traffic deaths in the city since Vision Zero started at the beginning of 2014. Pedestrians are the New York City road users who have benefited the most by the various Vision Zero initiatives. Fewer of them are getting injured or killed by motor vehicles. Last August 712 pedestrians suffered injury in a motor vehicle accident compared to respectively 775, 714, 854 and 855 in August 2016, 2015, 2014 and 2013. 7 pedestrians died in traffic accidents last August compared to respectively 15, 11, 10 and 12 in August 2016, 2015, 2014 and 2013. This is a record low number for both pedestrian injuries and deaths for the month of August. Despite this healthy decline, the numbers are still too high and more can be done. Bicycle accidents as well as resulting injuries and deaths also were at their lowest for the month of August. 1 cyclist died and 478 were injured in 606 accidents last August. A year before 2 of them died and 567 were injured in 694 accidents. In 2015 there were 3 deaths and 565 injuries in 707 bicycle accidents. 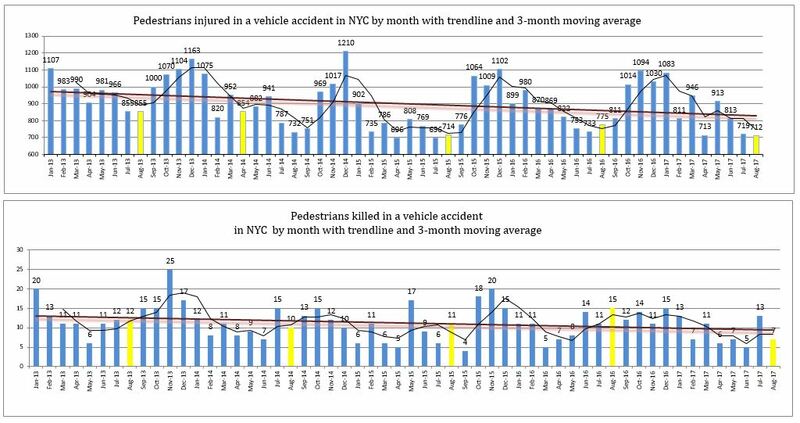 In 2014 these numbers were respectively 4, 491 and 646 and before Vision Zero started, 1 bicyclist died in August 2013 in New York City and 523 were injured in 655 accidents. 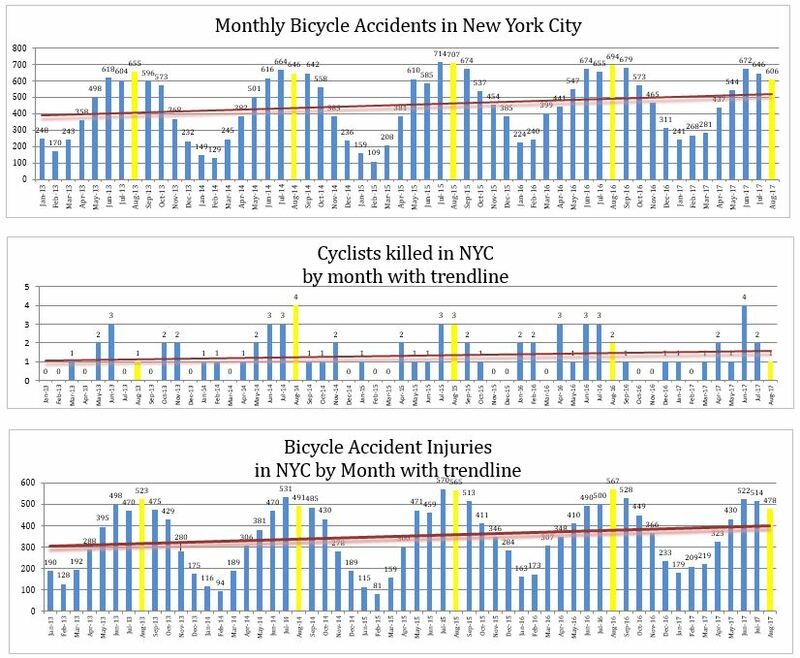 Despite some improvements, the streets of New York City are still very dangerous for bicyclists and the number of accidents as well as the resulting deaths and injuries continue to be on a rising trend. After declining during the first year of Vision Zero, motorcycle accidents jumped higher again and stayed above 350 during the month of August for the second consecutive year. In New York City, August is the worst month for motorcycle accidents. Last August the number of motorcycle accidents reached a record high at 379. It was slightly lower in August this year with 361 motorcycle accidents but still above the numbers recorded in August 2015 (340), August 2014 (307) and August 2013 (336). Bus accidents are always at their lowest in the city in August. School vacations may explain the August dip. There were 464 bus accidents in New York City last August compare to respectively 451, 476, 479 and 470 in August, 2016, 2015, 2014 and 2013. Despite a slight decline compared to the same month of the previous year, truck accidents continue to be unusually high in New York City. There were 1,444 truck accidents in New York City compared to 1,442 the previous month and respectively 1,483, 736, 643 and 634 in August 2016, 2015, 2014 and 2013.